Mouse anti Human Follistatin 288 antibody, clone 17/2 recognises human follistatin isoform 288 (FS288). Follistatin (FST) is a single-chain glycosylated protein of gonadal origin, originally identified as an antagonist of activin and suppressor of follicle stimulating hormone (FSH) synthesis/secretion. Alternative splicing of FST mRNA generates the two isoforms FS315 and FS288, the latter of which is the main cell-surface form and binds with high affinity to surface heparan sulphate proteoglycans, whilst FS315 binds with only low-affinity, and is considered to be the main circulating form of follistatin. As well as activin, FST interacts with other growth factors such as bone morphogenetic proteins (BMPs) -2, -4 and -7, myostatin, and growth differentiation factor 9 (GDF-9), playing a key role in cellular differentiation/proliferation, embryonic development and tissue repair.  Mouse anti Human Follistatin 288 antibody, clone 17/2 has been shown to exhibit 10% cross-reactivity with FS315 in an immunoassay. Evans,L.W. et al. (1998) Development, validation and application of an ultra-sensitive two-site enzyme immunoassay for human follistatin. J Endocrinol. 156 (2): 275-82. McPherson, S.J. et al. (1999) Expression of activin A and follistatin core proteins by human prostate tumor cell lines. Majdic, G. et al. (1997) Testicular expression of inhibin and activin subunits and follistatin in the rat and human fetus and neonate and during postnatal development in the rat.